Let’s make one thing clear right off the bat. I’ll only be saying this once so pay attention. I AM NOT A JOURNALIST. I’m just some guy with a website and an opinion. The question I get asked most is how did I get into doing this site? Not willingly is usually my first answer, or kicking and screaming. It never really was my intention to write about crime online. If you want the whole sordid story you’d have to go all the way back to the ancient times of 1982. 1982 was my first year of high school. My parents sent me to an all-male Catholic high school. I’m grateful for the education it provided but at the time I hated that school. To deal with the long bus rides, bullying and crippling depression I would write these really bad heavy metal lyrics. I mean really bad. The first one was called “To Rule In Hell”. The title was ripped off from Milton’s poem Paradise Lost that contains the line “Better to reign in Hell, than serve in Heaven.” My song was basically a ripoff of the Iron Maiden song ‘Number of the Beast’. Like I said, it was pretty bad. Back then there was no internet so I kept all my writings in a notebook. Occasionally I would show them to trusted associates. This went on until 1988 when I wrote the last of the first generation of my lyrics. Nine years go by without me writing another word. but 1997 did bring the internet to my life for good or bad. I set up a website on a free host that basically just told the world who I was. Since I was so into heavy metal the site was filled with skulls and blood. Back in 1997 people didn’t always openly share their true identities like today so I needed a cool screen name. I’m also a fan of comic books and all my favorite characters wore trench coats, i.e. The Punisher, The Question, and John Constantine. So I decided to call myself TheTrenchcoat. This would unleash a torrent of the second generation of my bad lyrics/poetry. Another year goes by and my depression worsens. The lyrics I write become darker and I often reference suicide. 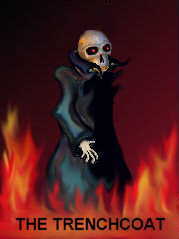 Between that and the blood and skulls, my site could have understandably been mistaken for being a goth site. April 20th, 1999. I was on my way to work that morning when I rear-ended my pick up truck into an 18 wheeler. Luckily I wasn’t going all that fast. Damage to my truck was minimal and damage to the 18 wheeler was nil. Since I’m a taller man my knees did hit the dashboard pretty hard. I got to work but my knees started hurting pretty bad. I left work to go get checked out at the hospital. My health insurance was supposed to have been in effect but when I called the insurance company they hadn’t received my paperwork yet. So I skipped the hospital, went home, took a couple of pain pills I had left over from a previous injury and went to sleep. I woke up briefly to hear an announcement on TV that said a school shooting had occurred in Colorado and that the gunmen supposedly called themselves ‘The Trenchcoat Mafia’. I thought to myself that no one would be stupid enough to confuse my website with anything to do with the shooting. I was wrong, very very wrong. After I went back to sleep a few news outlets reported that my site had something to do with Columbine. Most notably was the Washington Post who implied that my website was part of some larger trench coat-clad goth suicide cult. Then the hate mail started pouring in. Even after putting up a disclaimer on the site stating that the site had nothing to with Columbine and predated it by two years the hate mail continued. In its article, the WaPo even quoted the aforementioned “Death of a Jester” taking it completely out of context. It got to be too much so I took the website down and deleted it for good. As far as I was concerned TheTrenchcoat was dead. That lasted for about a year. I missed engaging with people on the internet the way I did with my website so in mid-2000 I launched a new website that was more in journal form than its predecessor. It had a blog-like feel to it but this was years before services like Blogger and WordPress were widely available. On this new site, I would write about crime, politics, entertainment, religion, and news but mostly crime. The crime I wrote about most? School shootings of course. In 2002 I launched my first proper blog, TheTrenchcoat Chronicles. The subject matter was usually split between politics and crime. Then in 2004, I met a real crime blogger by the name of Steve Huff. While I merely spouted opinion, Steve had real investigative skills that have actually aided in cracking some crimes. Yet when someone asked someone of his stature who the first crime blogger was, Steve always said it was me. I was more than humbled by that. It was at that time I decided to dump politics altogether and focus solely on crime. If I was going to be serious about this I couldn’t keep calling myself TheTrenchcoat. I needed a new moniker. Every one of my internet friends would call me Trench for short. Also at the time, I was running a short-lived blog called Tin Foil Hat under the pseudonym of Reynolds Rapp. When one of my online friends discovered I was both bloggers he called me Trench Reynolds and it stuck. With the advent of social media, I noticed that a lot of kids were being arrested after posting their threats and plots against their schools on MySpace. So in 2006, I launched my second successful blog, MyCrimeSpace. As you can probably tell by the name it focused on all matters of crime as it related to social networking. It was because of this that I was interviewed by TIME Magazine and Rolling Stone Magazine. Also in 2006, I was in the news for a more somber reason. A guy by the name of Kimveer Gill shot up Dawson College in Montreal killing one and wounding 19 before taking his own life. It turned out that in the months leading up to the Shooting Gill was a frequent commenter/troll on TheTrenchcoat Chronicles. When I made that fact public I expected the same kind of backlash I did in ’99. Again I couldn’t have been more wrong. The Canadian media and Canadian law enforcement could not have been more professional. In 2007 I launched my third semi-successful blog and it was born out of MyCrimeSpace. In the realm of social networking crime not only did I post stories about MySpace and Facebook but I also included craigslist because in many circles it’s considered to be the very first social networking site. Crime was getting so bad on craigslist that they started to outnumber the MySpace stories on MCS so I decided to devote a blog fully about craigslist crimes. That blog was called CraigsCrimeList. Notice a pattern? CCL may have been my most successful blog. Not only did I get to be on news shows like 48 Hours on CBS and AC 360 on CNN but it also allowed me to meet a real victim of human trafficking. Hearing her speech at a human trafficking symposium and talking with her one on one afterward completely changed what I thought I knew about trying to get out of prostitution and how difficult it really is. As the saying goes though, all good things must come to an end. With the decline in popularity in MySpace, the name MyCrimeSpace felt dated. Also with the rise of crime on craigslist competitor Backpage, it seemed a little unfair to single out craigslist in the CraigsCrimeList name. 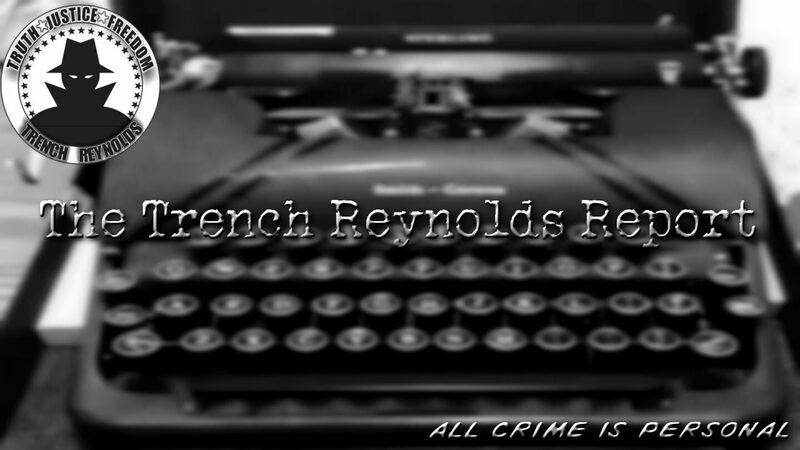 So I took all 3 of my remaining blogs and combined them into a blog called Trench Reynolds’s Crime News. In late 2014 I decided that I had more to offer on this site than just news and opinion on crime. After all, I’ve worked in the healthcare field for 25 years and have dabbled in various other pursuits that I decided to once again delve into other subjects and launched The Trench Reynolds Report and have redoubled my efforts towards hopefully becoming a true agent of change.